In July 2017,JAMApublished results from autopsies of the brains of 202 deceased American football players.1Of the 111 participants who had played in the National Football League (NFL), 110 (99%) received a neuropathologic diagnosis of chronic traumatic encephalopathy (CTE), a progressive neurodegenerative disease associated with head trauma. This 99% figure received substantial media coverage when the study was published. REFERENCE; Binney ZO, Bachynski KE. Estimating the prevalence at death of CTE neuropathology among professional football players. Neurology. 2018 Nov 28. pii: 10.1212/WNL.0000000000006699. doi: 10.1212/WNL.0000000000006699. [Epub ahead of print] PubMed PMID: 30487144. 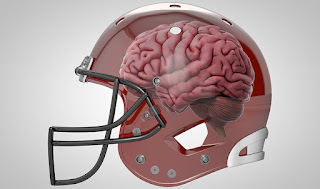 Commented on: InsideScience: What's the Risk of Chronic Traumatic Encephalopathy for NFL Players? New study suggests at least one in 10 NFL players could eventually develop the brain disease.